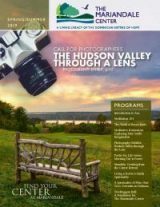 The Mariandale Center (TMC) in Ossining is excited to announce that we’re opening a Hudson Valley photography exhibit in June 2019, titled “The Hudson Valley through a Lens.” Local artists are invited to submit original entries for the exhibit, which will be on display though September, 2019. Entrants may price their entries to sell while on exhibit, with 25% of the sales price going to TMC as a donation. You may also choose to display and not sell your entries. Photographs must be a minimum of 8 x 10 inches (may be larger) and relevant to the Hudson Valley nature theme. All entries are subject to approval by photography exhibit committee. All entries must be mounted and/or framed and ready to hang. Entries must include a 3 x 5 inch index card attached to the back of the entry with the Title of the work, your Name and the suggested Sale Price (If not for sale, please indicate NFS). Submit an additional 3 x 5 inch index card with the Title of the work, your Name, Address, Phone #, and Email. Please include the donation amount (minus 25% of sales price) if photograph sells. All entries must include a $15 fee per photograph. Entries will be accepted in the order they are received. Entries should be dropped off at the Mariandale Center during business hours. The Center is located at 299 North Highland Avenue, Ossining, NY. Please call (914) 941-4455 if you need additional information. Please ask for Karen Bernard at extension 106, or Suzanne Smith at extension 212. Please join us for an opening Photographers’ Reception on Thursday, June 13, from 6:30 to 8:30pm. This reception will take place in our dining room, with light refreshments served. To enter an Original Photograph: March 20 – May 1, 2019 (see guidelines above), please complete a program registration form. Thank you and we look forward to seeing your entries!